From the world’s highest navigable lake to the world’s largest river, a luxury cruise on one of Peru’s stunning waterways is equal parts custom Peruvian vacation and awe-inspiring natural wonder. For discerning travelers with a preference for authentic travel experiences, a luxury cruise in Peru is worth considering for your custom Peru tour. 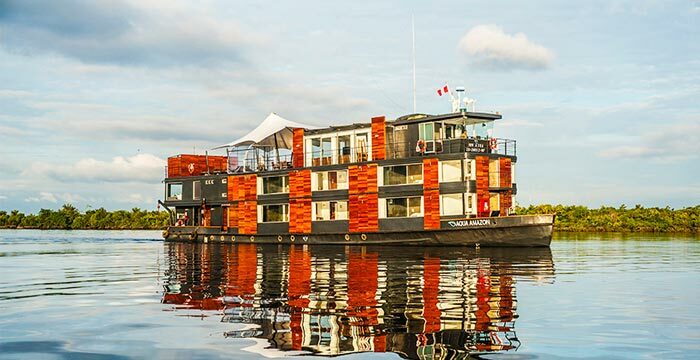 Sail in style during a luxury Amazon cruise along a river that is not only the world’s largest by volume, but is also one of the planet’s greatest natural treasures. You’ll travel on the luxurious MV Aria vessel, which will cut a path through the wildlife-rich corners of the dense rainforest. Float at a leisurely pace through the pristine Pacaya Samiria Reserve, alongside colossal Victoria Regia water lilies whose diameter can often be as long as humans are tall. Take excursions on foot and by canoe into the protected wildlife area for critter spotting. Look for love-struck pairs of monogamous macaws, dazzling flocks of immaculate snowy egrets and Amazon kingfishers flitting about in the air, and listen out for the shrill guffawing call of the laughing falcon, the rustle of frolicking squirrel monkeys and the chirps and squawks of pink dolphins chatting the water. And if wildlife meet and greets aren’t enough, you’ll also encounter the Amazonian locals who continue to live in largely the same manner as they have for centuries – an experience that will resonate with you for years to come. At 12,500 feet above sea level and covering an area of over 3,300 square miles, this shimmering high-altitude lake never fails to make an impression on travelers. With the Cordillera mountain range rearing up in the distance beyond its shores, it is a truly awe-inspiring scene. 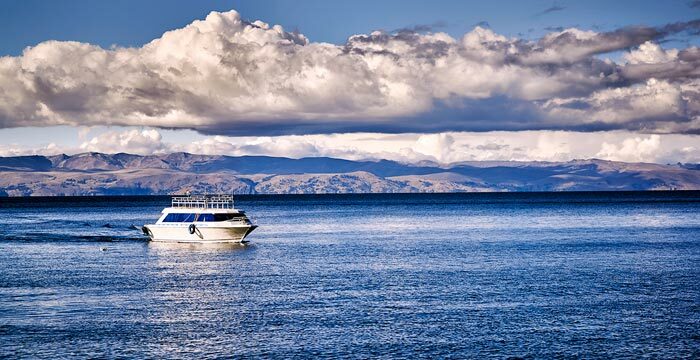 During a luxury cruise on Lake Titicaca, you’ll travel to the Floating Islands of Uros, a group of approximately 60 artificial, man-made islands comprised of matted totoro reeds. Every year, the inhabitants of the floating colony must renovate the island floor with fresh reeds and mud. Continue the cruise on Taquile where islanders still carry on the centuries-old tradition of weaving. Eat a lunch prepared by Taquile locals and chat to them about island life, before returning back to the mainland to continue your personalized Peru vacation.